This modern apartment has a bright living and dining room with a comfortable sofa, TV, DVD player, a dining table with 4 chairs and access to a balcony. There is a fully equipped kitchenette, including a kettle, toaster and coffee-maker. The apartment has 1 spacious double bedroom with a built-in wardrobe and large windows. The contemporary bathroom has a bathtub and shower, as well as a hairdryer, towels and courtesy toilet paper. This accommodation is located in El Raval, right next to the famous Rambla. It is also opposite the Gran Teatre del Liceu. 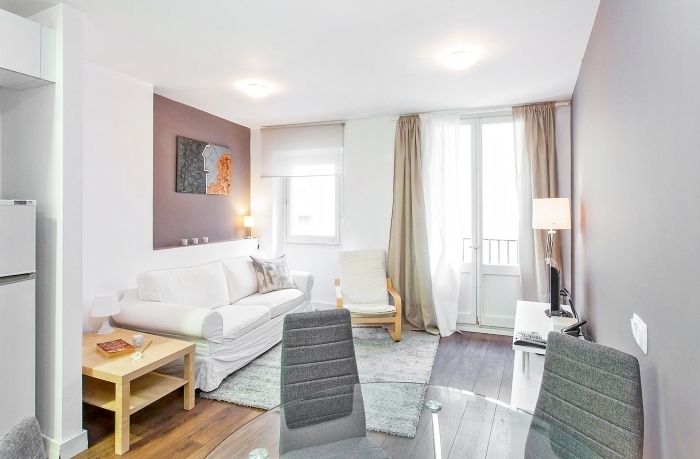 This is a perfect, central location as everything is nearby, however if you want to venture further afield, Liceu metro station (L3) is a 1 minute walk away. 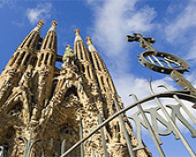 You will find lots of shops, bars, cafés and restaurants nearby, as well as famous attractions such as La Boqueria market and Plaza Catalunya.